Play video Should the second Ballymena United goal have been awarded? from BBCShould the second Ballymena United goal have been awarded? Play video McGrory gives Ballymena United the lead! from BBCMcGrory gives Ballymena United the lead! 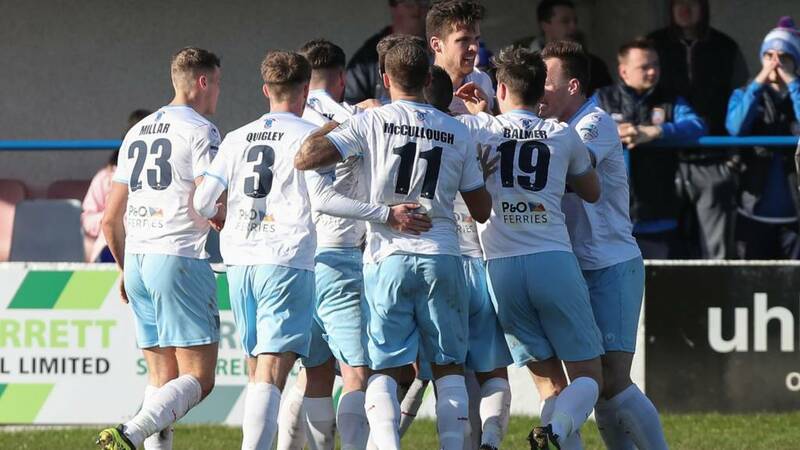 Well, that's about your lot from another day of Premiership action which saw Ballymena breathe fresh life into their league title challenge by trouncing derby rivals Coleraine 4-0 on their home patch. Andy McGrory is the toast of the Braidmen tonight as he went home with the match ball after scoring his first-ever senior hat-trick, while Adam Lecky added to his tally for the season. That leaves just six points in it at the top now with Ballymena having a match in hand over leaders Linfield. The title race is most certainly on. Elsewhere, Joe Gormley's winning goal made it four wins from five for new Cliftonville manager Paddy McLaughlin as the Reds ran out 1-0 winners over Institute. Dungannon's late comeback at Stangmore Park saw the Swifts inflict a crushing blow on struggling Newry City and move up to seventh place in the table in the process. Ten-man Ards drew 1-1 with Glentoran to move a point clear of Newry at the bottom. Keep an eye on the BBC Sport NI website for highlights of all today's games appearing soon and join us again on Tuesday night for live video, audio and text commentary coverage of the County Antrim Shield final between Crusaders and Linfield at Seaview. Highlights and analysis from the weekend's Irish Premiership action. This week's guest pundit is Glenavon's Sammy Clingan. It was important that we got a victory today to pick the boys up after last week and ensure that our season stays alive. Yes, we left it late but we got there in the end. Paul McElroy has been top class since I came to the club and he got his just rewards with our first goal and a couple of our players are claiming the winner! We are still a work in progress but we are ticking along nicely. Goals from Martin Donnelly, David McDaid and Ben Tilney clinch the Chamipionship title for Larne and secure promotion to the Irish Premiership. Where will they finish next season? I was disappointed by our performance, I thought we were sluggish throughout. We knew Ards would come here full of energy and we wanted to make sure we matched that. I think we did match their energy but that is all we did - we didn't take it any further than that and the quality of our crossing from both sides just wasn't good enough. I didn't see the sending off incident well enough to know if Nelson deserved his red card. The game swung massively in Ballymena's favour on the basis of two decisions. I have no complaints about Gareth McConaghie's sending off but I didn't feel their second goal crossed the line. There wasn't a person inside the ground who appealed for that but we just have to take it on the chin and move on. I'm absolutely delighted with my team's performance today - I really couldn't have asked for any more from the players. I ask an awful lot of them and it's not easy to play in the way I want to play, but they all put the work in and showed what they've got in their locker. I didn't think the Glens were hurting us and I'm disappointed that we conceded the equaliser from a set-piece. In terms of the sending off, I'm going to back my player and say he didn't deserve the red card. Delighted with the performance, we had a game plan coming here today. We knew we wouldn't have the ball at times and we knew how much of a threat they are going forward but in terms of the performance and how we executed the game plan, I can only praise the players. The last couple of minutes, we had a great opportunity and it's disappointing we didn't take it. I thought they got edgy because they didn't put it to bed but I was pleased with how we restricted their frontline. I am so proud of my players as the conditions were awful. It's all about how the players perform and they worked their socks off and they were outstanding - all credit to them. Because of injuries we put Andy McGrory in midfield and he scored three great goals. It's one game at a time and this is just a win and another three points. It was a strange feeling playing against the team I was part of for ten years. But it was back to work and I thought our boys were excellent today. Joe [Gormley] has been top class since we've come in. He's taken a bit of criticism for not scoring but his all-round has been improving and he's scored the winner today. Last week he was man of the match and today he led the line brilliantly. I thought we defended well, too, commanding our box well except for one chance late in the game. It's finished all square at the Oval as the 10 men of Ards hold on for what could be a vital point at the Oval. The visitors took the lead in the 42nd minute through Michael McLellan, but they went down to 10 men on the stroke of half time when Kym Nelson saw red. Darren Murray equalised midway through the second half but Warren Feeney's men held on to go a point ahead of bottom-side Newry City in the battle to avoid the drop. An amazing final few minutes at Stangmore Park as two late goals earn Dungannon victory. Newry remain bottom of the table. It's all over at Ballycastle Road and Ballymena move to within six points of Linfield at the top of the table with a match in hand. It's getting very interesting again at the summit of the table. Glentoran denied by the woodwork with minutes to go as defender William Garrett's header comes back off the crossbar. High drama as Dungannon substitute Johnny Lafferty heads home from a Jarlath O'Rourke corner!